On December 17, 2010 Brewster Kahle received the Zoia Horn Intellectual Freedom Award for successfully challenging a National Security Letter (NSL) issued by the FBI that demanded personal information about a user of Internet Archive’s site, archive.org. You can see the award presentation and hear Brewster recount the entire ordeal. 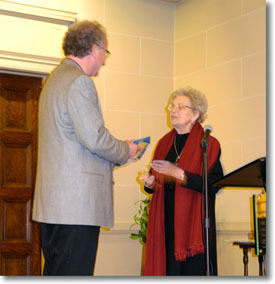 Zoia Horn presented the award and spoke of her own ordeal as the first librarian to be jailed for refusing to divulge information that violated her belief in intellectual freedom during the 1972 conspiracy trial of the “Harrisburg Seven” anti-war activists. You can also see photos of the lunch event at Internet Archive prior to the presentation in the great hall. This entry was posted in News and tagged brewster kahle, internet archive, zoia horn. Bookmark the permalink.